A warehouse manager is a person who is responsible for maintaining the warehouse of the company. They organise the receipt and also make sure that the storage, as well as the dispatching of the goods of the warehouse, is being performed smoothly. A warehouse manager has to write the resignation letter when he wants to switch to another job because of any reason. Change is the major part of the time. People continuously change their job for many reasons. Leaving a place where you have spent many years or months can be a little tough. A resignation letter is a good-bye letter that should be written very positively. A positively written resignation letter enables the employee to maintain a good relationship with the boss and also smoothens the process of transition. Try to be honest while writing this resignation and make sure that you are not criticising the company or the job. It is your duty to point out all those things that have caused you to leave the job so that you can bring improvements in the system of the organisation. Try to keep the resignation to the point and short. The language of the letter should be simple and easy to understand. There should not be any contradiction in the information provided in the resignation letter. 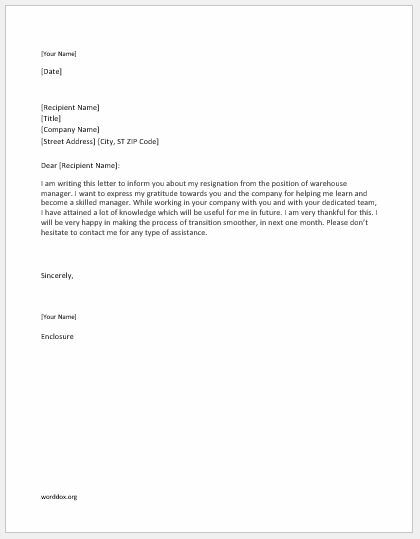 Here is a sample resignation letter for a warehouse manager. I am writing this letter to inform you about my resignation from the position of warehouse manager. I want to express my gratitude towards you and the company for helping me learn and become a skilled manager. While working in your company with you and with your dedicated team, I have attained a lot of knowledge which will be useful for me in future. I am very thankful for this. I will be very happy in making the process of transition smoother, in next one month. Please don’t hesitate to contact me for any type of assistance.